last Sept I had fallen and did a pilon fracture of my right ankle. 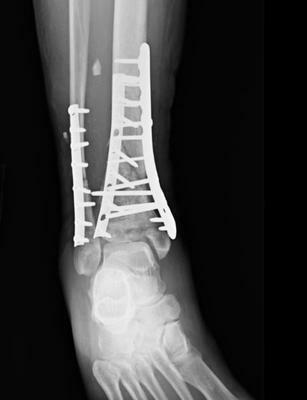 They had to repair the tibia and fibula using plates and screws. The right side incision healed nicely but the left side has been red and now swollen (like egg) and is painful. I am having a patch test done next week to see if there is a allergy to metal. There is certainly a possibility that you are having a reaction to the elements of the hardware that has been implanted in your ankle. There is also the possibility that there is just too much hardware in the tibia. Your surgeon had to implant that much hardware simply because that was the only way to get all the "broken" pieces back together. If you press down on the same area of your left lower leg, there is not much soft tissue there between the skin and bone. It would not be surprising to have swelling and associated pain particularly only five months after surgery, as a result of the hardware being directly underneath the skin. If you get lucky, and you are not having a reaction to the hardware, then hopefully over time the swelling and pain will diminish. If that does not happen, then somewhere down the road once the broken fragments have healed, you might have to entertain having some or all of the hardware removed, or replaced with smaller components. My best advice would be to speak to your surgeon about your options going forward.